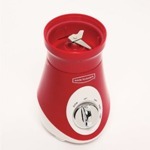 If you are looking for a smaller machine for personal rather than family use, the Back to Basics SE3000 Smoothie Express Lifestyle could be a great choice for you as with its 26 ounce jar, it makes about half the quantity of a full-size countertop machine – yet it makes enough for two servings if you need it to. This Back to Basics model has very sharp blades to efficiently deal with frozen fruits, ice and hard ingredients and it features three speed settings and a pulse to ensure fast, even blending. The compact design (measures only 14” tall and 5.5” in diameter), includes an insulated container which can double as a travel mug by fitting the secure lid which prevents spills. This model comes complete with a manufacturer’s one year warranty. I found this model is available at a big discount on Amazon.com from where it can also be shipped to countries outside of the US. It gets an excellent 4.5 out of a possible 5 stars in customer reviews (go direct to the product page with the link above). Customers report that they like the stylish look of the machine in their kitchens and that they appreciate the fact that the cup size is greater than that of the Magic Bullet single serve smoothie maker. They also report that it is considerably quieter in operation than the Bullet, blends ingredients much faster – and several people said that in their opinion, it represented better value. Reviewers said that the blade attachment is quick and easy to wash and very simple to screw into position in the cup. They also said that they liked the fact that everything is dishwasher safe and that because the blade is completely removable, there are no nooks and crannies for those last few remnants of mixture to get stuck and cause a problem with bacteria. The easiest way to clean the majority of any residue is to put a small amount of water into the blending container and then ‘blend’ this and tip the contents away before washing the parts. Everyone says that the blades are very powerful; a few seconds on pulse, followed by about fifteen seconds on low power and then another fifteen seconds on medium power will have a smoothie containing ice and frozen fruits blended smooth. Be sure to read the instructions for blending hard and frozen ingredients and you should not experience any problems. This smoothie maker is also great for making protein shakes or meal replacement shakes which are easy to make and you can whizz up a complete meal in a cup in just a few seconds. 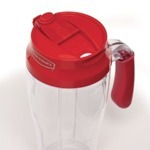 The blender jar becomes a take and go, drinks container that you can drink directly from by screwing on the drinking lid or cap. The jar is insulated so drinks made with frozen ingredients stay really cold for ages. The rubberized handle is nice to hold and the drinking cap itself has a lip groove that makes it pleasant to drink from (or you can put an ordinary drinking straw through the hole in the lid. Some people did report though that with really thick smoothies it was a little hard to drink from the cup with the lid in place. Overall view? 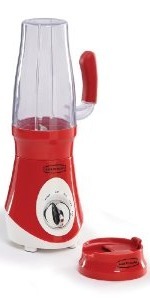 The Back to Basics SE3000 Smoothie Express Lifestyle is a great personal blender and ideal for making one or two servings at a time. 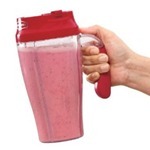 I like the fact that you can use the cup as your drinks container and enjoy your smoothies on the go! If you would like to read more customer reviews or are considering purchasing this model, please use the link provided to visit the product page on Amazon.com where it is available at a great price. If you are still unsure, why not check out our article on the best blenders for smoothies, including the Tribest Personal Blender?